To Cite: Rezaee-Zavareh M S, Hesamizadeh K, Sharafi H, Alavian S M. Treatment of Hepatitis C Infection with Direct-Acting Antiviral Agents in Liver-Transplant Patients: A Systematic Review and Meta-Analysis, Hepat Mon. 2017 ; 17(6):e12324. doi: 10.5812/hepatmon.12324. Context: Recurrence of hepatitis C virus (HCV) infection after liver transplantation (LT) can be prevented, using antiviral therapy and new treatment regimens. Combination of protease, NS5A, and NS5B inhibitors, with or without pegylated-interferon and ribavirin (PEG-IFN/RBV), results in significantly high rates of sustained virologic response (SVR) among post-LT patients with HCV infection. In this study, we aimed to assess the efficacy of direct-acting antiviral (DAA) regimens in post-LT patients with HCV infection. Evidence Acquisition: We conducted a systematic search in electronic databases to detect eligible studies on DAA treatments after LT. We evaluated English-language studies, including clinical trials and cohort studies, which used antiviral DAA regimens (with or without PEG-IFN/RBV) and reported SVR rates at 12 weeks after the end of treatment (SVR12). After data extraction, the pooled SVRs were calculated, using STATA version 11. Results: A total of 35 studies with various HCV genotypes were included in our analysis. Due to the small sample size and lack of suitable data on HCV genotypes 2 - 6, the meta-analysis was only conducted among patients with HCV genotype 1; the results of other studies were also obtained. SVR12 rates ranged from 91% to 97% in patients with 12- or 24-week sofosbuvir (SOF)/simeprevir (SMV) ± RBV, SOF/ledipasvir (LDV) ± RBV, and SOF/daclatasvir (DCV) ± RBV regimens. The minimum SVR12 rate was found in patients receiving SMV plus PEG-IFN/RBV (59%; 95% Confidence Interval, 49 - 68). Conclusions: Administration of new HCV DAA regimens can prevent post-LT HCV infection. The combination of SOF/DCV and SOF/LDV, with or without RBV, for 12 or 24 weeks can produce high rates of SVR12 in post-LT HCV patients in different settings. Hepatitis C virus (HCV) infection, with an estimated prevalence of 3%, affects about 180 million people worldwide. It is considered a major cause of cirrhosis, hepatocellular carcinoma (HCC), and death (1, 2). As this infection can cause end-stage liver disease (ESLD), liver transplantation (LT) is regarded as the treatment of choice. Moreover, HCV reinfection can occur in LT recipients and reduce both graft and patient survival (3). Previously, a combination of pegylated-interferon (PEG-IFN) and ribavirin (RBV) was used for the treatment of post-LT HCV patients and those awaiting LT. However, this regimen is too difficult to tolerate for this group of patients and can prevent HCV recurrence in only 20% of post-LT patients (4). In addition, this approach can provide sustained virologic response (SVR) rates of only 20% - 30% and 40% - 50% in LT recipients with HCV genotype 1 and those with genotype 2 or 3, respectively (5). Direct-acting antivirals (DAAs) have majorly transformed HCV treatment, particularly in patients with advanced liver disease (6, 7). Until now, various DAAs in different classes have been approved for HCV therapy. Overall, there are 4 protease inhibitors including simeprevir (SMV), paritaprevir (PTV), asunaprevir (ASV), and grazoprevir (GZR), 5 NS5A inhibitors including daclatasvir (DCV), ledipasvir (LDV), ombitasvir (OBV), elbasvir (EBR), and velpatasvir, and 2 NS5B polymerase inhibitors including sofosbuvir (SOF) and dasabuvir (DSV) (8). Appropriate combinations of these drugs have been used in the setting of LT.
With this background in mind, in this systematic review and meta-analysis, we aimed to evaluate the efficacy of DAA-based treatment approaches among post-LT HCV patients. A systematic search was performed in PubMed, Scopus, and Web of Science databases on November 28, 2016, using the following keywords: “hepatitis C”, “direct-acting antiviral”, “simeprevir”, “paritaprevir”, “asunaprevir”, “grazoprevir”, “daclatasvir”, “ledipasvir”, “ombitasvir”, “elbasvir”, “sofosbuvir”, “dasabuvir”, and “liver transplantation”. Moreover, Google Scholar was searched with the same keywords to study the gray literature. Title screening was terminated when 50 unrelated serial titles were observed in the search results. Furthermore, the references of the included studies were screened for related titles missed in the main electronic search of the study. All studies from peer-reviewed journals, investigating the efficacy of HCV antiviral regimens with SOF, LDV, DCV, PTV, OBV, DSV, ASV, GZR, EBR, or SMV in post-LT patients, were included. On the other hand, studies with languages other than English and inclusion of patients on telaprevir and boceprevir were removed. Treatment efficacy was defined as SVR at 12 weeks after the end of treatment (SVR12), based on the intention-to-treat analysis in the studies. All the eligible articles included SVR rates according to the HCV genotype, treatment duration, and RBV use. All clinical trials and cohort studies, reporting SVR in more than 5 patients, were included in the quantitative analysis; otherwise, they were excluded from the final quantitative analysis. This study was conducted, based on the PRISMA guidelines for reporting systematic reviews (9). Based on the eligibility criteria, 2 authors screened the publications at each level (including title, abstract, and full-text). Disagreements at any level of screening were mutually resolved by discussion, and the remaining discrepancies were resolved by discussion with a third reviewer. Afterwards, data including the name of the first authors, publication year, sample size, HCV genotype, treatment duration, use of RBV, SVR rate, and relapse were extracted from each arm of each trial. In this meta-analysis, all pooled SVR rates were calculated, using STATA version 11. Based on the I square and Chi square test results on the heterogeneity of the findings, fixed- or random-effect models were used to pool the SVR rates. P value less than 0.1 was considered as significant heterogeneity in Chi square test. The metaprop command was used to calculate the pooled SVR rate and 95% confidence interval (CI). In addition, the ftt option was combined with the metaprop command to obtain an admissible CI (10). As presented in Figure 1, we found 608 papers through searching the databases. By using EndNote software, 122 duplicated studies were found, and consequently, 486 papers were screened. By screening the titles and abstracts, 432 records were found to be irrelevant to our search. For full-text screening, we excluded 19 papers because of the following reasons: treatment of waitlisted patients for LT (11, 12), use of telaprevir-based therapy (13), lack of data on SVR12 (14), lack of specific information on SVR12 with respect to RBV use, HCV genotype, and treatment duration (15-28), and subanalysis of other studies (29). The characteristics of 35 eligible studies are presented in Tables 1-6 and the sections below. HCV Genotype W/O SVR, No. Abbreviations: ND, Not Determined; RBV, Ribavirin; SD, Standard Deviation; SVR, Sustained Virologic Response; W/O, Without. aPatients are coinfected with HIV infection. Abbreviations: RBV, Ribavirin; NA, Not Available; SD, Standard Deviation; SVR, Sustained Virologic Response. aThree cases were treated for an extra 4 weeks with RBV therapy. bFour patients did not receive RBV because of baseline hemoglobin level < 10.
cFour patients with fibrosing cholestatic hepatitis (FCH) were treated for 24 weeks. dAll patients were coinfected with HIV. eEight cases were treated. One patient was infected with HCV genotype 2 and was treated with SOF/RBV. The mean age corresponds to 8 patients. fEleven cases with relapse were observed among 151 patients treated with or without RBV. gFew patients were treated for 24 weeks. hOne patient with HCV genotype 4 was included. Abbreviations: ND, Not Determined; RBV, Ribavirin; SD, Standard Deviation; SVR, Sustained Virologic Response; W/O, Without; SOF, Sofosbuvir. aTwo cases were coinfected with HIV. Abbreviations: ND, Not Determined; RBV, Ribavirin; SD, Standard Deviation; SVR, Sustained Virologic Response; W/O, Without; Un, Unknown. aData for age and gender were not available for extraction according to our classification. bOne patient was infected with 2 HCV genotypes (1 and 6). cRBV was discontinued in 2 patients. dRBV was discontinued in 13 patients. We found that different treatment regimens have been used in LT patients: OBV/PTV/ritonavir (r)/DSV/RBV, SOF/PEG-IFN/RBV, SOF/RBV, SMV/PEG-IFN/RBV, SOF/SMV ± RBV, DCV/SMV ± RBV, SOF/DCV ± RBV, SOF/LDV ± RBV, and DCV/ASV. In our analysis, we evaluated these different regimens. In case relevant studies were found for each regimen, we performed a meta-analysis to calculate the pooled estimation of SVR12 rates and CIs. A summary of the results related to the meta-analysis is presented in Table 7. Abbreviations: CI, Confidence Interval; DCV, Daclatasvir; PEG-IFN, Pegylated Interferon; RBV, Ribavirin; SMV, Simeprevir; SOF, Sofosbuvir; SVR, Sustained Virologic Response. We found 1 eligible study for the OBV/PTV/r/DSV/RBV regimen, in which 34 LT patients with HCV genotype 1 were treated during 24 weeks (61). In total, 33 (97%, 95% CI, 85 - 100) patients achieved SVR12, and only 1 patient relapsed within 3 days after the treatment; however, no other eligible studies were found. According to our review, studies related to SOF/PEG-IFN/RBV regimen did not classify the findings, based on the patients’ genotype or treatment duration; therefore, as mentioned before, we could not include these studies in our analysis. We found 5 studies evaluating SOF/RBV regimen in LT patients with different genotypes (genotypes 1 to 4) (Table 1). The meta-analysis only included 2 studies on the effect of 24-week therapy with SOF-RBV in patients with HCV genotype 1 (total sample size, 40) (30, 31). The results of these studies showed no significant heterogeneity (x2, 0.68; P = 0.40; I2, 0%), and the pooled SVR12 rate was calculated as 75%, based on the fixed-effect model (95% CI, 60 - 89) (supplementary file, appendix 1). In addition, this regimen (12- or 24-week) has been used in patients with HCV genotypes other than genotype 1; however, the sample sizes were quite limited. The results of these studies are presented in Table 1. We found 5 studies, which evaluated the effect of SMV/PEG-IFN/RBV regimen among LT patients with HCV genotype 1 (Table 2). The treatment duration was 12 weeks in these studies. Four of the articles had a total sample size of 100 and were used in the meta-analysis (35-38). We detected no heterogeneity between the results of these studies (x2, 0.78; P = 0.85; I2, 0%). Based on the fixed-effect model, SVR12 rate for this regimen was 59% (95% CI, 49 - 68; supplementary file, appendix 2). Furthermore, in a previous study, this regimen was used during 24 weeks for 9 patients with HCV genotype 1, and the reported SVR rate was 77.78% (39). We detected 18 study arms investigating the effect of SOF/SMV ± RBV regimen in LT patients (Table 3). In all these studies, patients were infected with HCV genotype 1, and the treatment duration was 12 weeks. We used studies with a sample size of more than 5 and performed 2 meta-analyses (one for the regimen without RBV and 1 for the regimen with RBV). A total of 11 studies with a total sample size of 505 were included in the meta-analysis of SOF/SMV regimen (33, 34, 40-43, 45, 47-50). There was no significant heterogeneity between the results (x2, 0.59; P = 1; I2, 0%), and based on the fixed-effect model, the pooled SVR rate was 92% (95% CI, 89 - 94) (supplementary file, appendix 3). Additionally, for SOF/SMV/RBV regimen, we conducted a meta-analysis on 4 studies with a total sample size of 117 (43, 44, 47, 48). We found no significant heterogeneity (x2, 0.48, P = 0.92, I2, 0%), and the pooled SVR rate was 91% (95% CI, 85 - 96) (supplementary file, appendix 4). We detected 2 studies evaluating the effect of 12- or 24-week treatment with DCV/SMV ± RBV in LT patients (51, 52). Both studies included patients with HCV genotype 1. However, given the difference in treatment duration and the small sample size of these studies, we could not conduct a meta-analysis for this regimen. The characteristics of these studies are presented in Table 4. SOF/DCV ± RBV regimen has been used for LT patients with different HCV genotypes during 12 and 24 weeks. We identified 12 studies evaluating this HCV treatment regimen (Table 5). However, the sample size of studies evaluating HCV genotypes other than genotype 1 was quite limited, and we could not conduct a meta-analysis. We performed a meta-analysis on 2 eligible studies (total sample size, 59) (54, 55), using 12-week SOF/DCV/RBV regimen in patients with HCV genotype 1, based on the fixed-effect model (x2, 0.03; P = 0.86; I2, 0%). The pooled SVR12 rate was measured to be 97% (95% CI, 91 - 100) (supplementary file, appendix 5). The characteristics of the remaining studies are presented in Table 5. SOF/LDV regimen has been used in LT patients with 2 HCV genotypes (genotypes 1 and 4). The sample size of studies on HCV genotype 4 was limited, and we could not conduct a meta-analysis for this genotype. However, we carried out 4 different meta-analyses for genotype 1. As the results showed no significant heterogeneity in each meta-analysis (I2, 0% for 4 meta-analyses), we used the fixed-effect model. The meta-analyses were performed on different regimens, including 12-week SOF/LDV (2 studies; sample size, 101) (57, 58), 12-week SOF/LDV/RBV (3 studies; sample size, 249) (56, 57, 59), 24-week SOF/LDV (2 studies; sample size, 55) (54, 55), and 24-week SOF/LDV/RBV (3 studies; sample size, 239) (56, 59, 60). The pooled SVR12 rate (95% CI) for these regimens was 97% (92 - 100) (supplementary file, appendix 6), 95% (91 - 97) (supplementary file, appendix 7), 97% (90 - 100) (supplementary file, appendix 8), and 97% (95 - 99) (supplementary file, appendix 9), respectively. We found 1 eligible study for DCV/ASV regimen through updating our search (62). In this study, 10 patients, infected with HCV genotype 1b, were treated with DCV/ASV for 24 weeks. Overall, 9 patients had a history of treatment with PEG-IFN/RBV, 1 had HIV infection, and 5 had end-stage chronic kidney disease. One patient developed aortic valve stenosis and left the treatment. All other patients completed the treatment protocol and achieved SVR12. 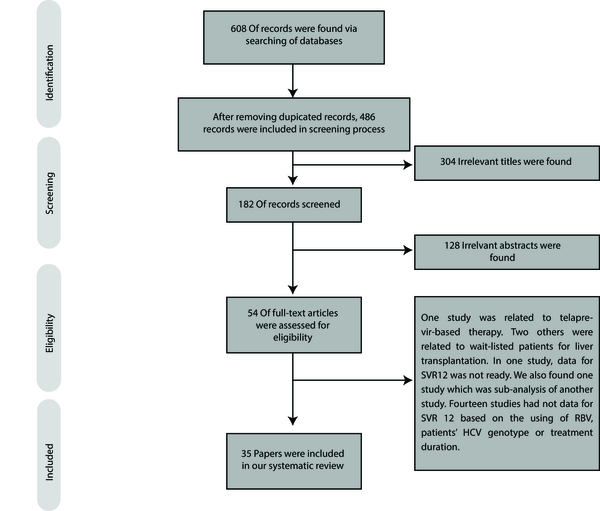 This study is the first systematic review and meta-analysis evaluating the available DAA-based treatment regimens for HCV patients with a history of LT. Clearly, HCV can lead to ESLD and HCC, which are the main indications of LT (63, 64). Recurrence of HCV infection in LT recipients can be universally observed in patients with detectable HCV at the time of transplant. This condition can progressively lead to liver fibrosis and failure, which are more difficult to treat (65, 66). Also, a lower survival rate has been reported in HCV-infected LT patients, compared to non-HCV LT patients (3, 67). Likewise, a specific type of HCV recurrence in LT patients, known as fibrosing cholestatic hepatitis (FCH), is characterized with an accelerated phase of portal fibrosis and cholestasis, resulting in liver failure (68, 69). Viral cytotoxicity in the setting of immunosuppression is one of the proposed mechanisms for FCH (70). It is estimated that 2% - 10% of HCV-infected LT patients experience FCH (71). DAAs have provided great results in the treatment of HCV-infected LT patients; accordingly, in this study, we evaluated the efficacy of all these regimens. We found that the majority of studies used regimens containing SMV, especially SOF/SMV. Overall, SMV has been used in combination with different drugs, such as PEG-IFN, SOF, and DCV for the treatment of LT patients with HCV genotype 1 and has produced different SVR rates. Although combination of this drug with PEG-IFN and RBV could provide an SVR rate of 59%, an SVR rate of > 90% was achieved with SOF, used with or without RBV. This finding shows that we should exclude IFN-based regimens in the settings of LT (72). In addition to improved SVR rates, short follow-ups in patients with SOF/SMV regimen showed that viral eradication could be effective in the improvement of hepatic function and model for end-stage liver disease (MELD) scores (12). However, this issue should be further investigated, using long-term follow-ups. It should be noted that pretreatment status of liver disease might influence the rate of SVR and relapse; also, patients with high MELD scores might have a lower chance of achieving SVR (12). In addition, we found that SMV should be avoided in LT patients receiving cyclosporine, as an immunosuppressive agent (73). Moreover, patients with HCV genotype 1a and NS3 Q80K resistance-associated substitution (RAS) had a lower chance of SVR, compared to those without RAS in response to SMV (as one of the NS3 protease inhibitors); they also frequently experienced virologic failure in this treatment approach (74-76). Another limitation of SMV use is that protease inhibitors should be avoided in patients with Child-Pugh class B and C (77). The combination of DCV with SOF and SMV has been also considered in the treatment of HCV infection in the context of LT. Although we could only conduct a meta-analysis on 12-week SOF/DCV/RBV regimen in LT patients with HCV genotype 1, SOF/DCV ± RBV has been used for all HCV genotypes. The efficacy of 24-week treatment with SOF/DCV is generally higher than DCV/SMV. It also has a higher SVR rate in the setting of FCH, compared to DCV/SMV (52). DCV does not need to be dose-adjusted in the setting of renal or hepatic impairment. In addition, it is a highly effective drug in the context of LT because of its pangenotypic activity, lack of interaction with immunosuppressive agents, and absence of major adverse events (52, 78). Improvement of indices related to hepatic function, such as serum concentration of alanine aminotransferase and MELD score, is another advantage of DCV, which should be further evaluated in long-term follow-ups (16, 52). Nevertheless, achieving SVR12 cannot always guarantee improvement in the hepatic function of LT patients with HCV recurrence. For instance, occult HCV infection, which is more difficult to detect than its overt form (79, 80), has been reported as an important factor (81). Therefore, further investigations are required to evaluate the effect of DAA-based treatments on this type of HCV infection (82, 83). Similarly, it was reported that viral eradication with SOF/LDV could improve the hepatic function. In fact, this regimen can be an appropriate option for the treatment of FCH patients (56). Although the preliminary results showed a lower SVR in LT recipients with HCV infection and Child-Pugh class C, the results were not significant and further investigations are required (56). Based on the results, 12- and 24-week SOF/LDV ± RBV regimens have been used in the treatment of LT patients with HCV genotype 1 or 4; in all treatment groups, SVR rates ≥ 95% were reported. It seems that RBV has no significant effects on HCV-infected LT patients in either 12- or 24-week therapy (57). Although SMV was the most widely used DAA for HCV-infected liver recipients, it has different limitations as mentioned earlier. In contrast, combination of SOF/LDV with SOF/DCV in the context of LT could offer a greater chance of SVR with fewer limitations; as a result, these regimens are being increasingly used in this context. Furthermore, combination of SOF/velpatasvir has been approved as a pangenotypic regimen, which can be probably used in LT patients (84). In this study, we only evaluated SVR rate in different treatment approaches. However, selection of appropriate treatment regimens for HCV-infected LT patients depends on some other important factors, which should be taken into account. Some of these factors include cirrhosis, stage of liver disease, renal insufficiency, concurrent immunosuppressive treatment, and presence of RAS. As discussed earlier, patients with a more advanced liver disease have a lower chance of achieving SVR; this finding has been observed in different DAA regimens. On the other hand, LDV and DCV showed good results. Therefore, more studies should be performed to evaluate these drugs in the mentioned settings and reach a more definite conclusion. Since the patients’ pretreatment status can affect the SVR rate, treatment after LT may provide a greater chance of SVR. However, optimal timing for the treatment of HCV-infected LT patients is a challenging issue. Overall, there are limited reports regarding the treatment of patients on the waiting list for LT. According to the literature, patients with more severe liver diseases achieve lower SVR rates (55, 56, 59). Furthermore, it should be noted that patients with more severe liver diseases are not usually studied for HCV treatment and are directly considered for LT. However, treatment of waitlisted patients for LT has some considerable advantages. Improvement of liver function may remove the patients’ need for LT, help avoid HCV recurrence after LT, and reduce concerns about interactions between immunosuppressive and HCV treatment drugs (85). Treatment is recommended for decompensated cirrhotic patients with an indication for LT, according to the MELD scores (77); patients with MELD scores ≥ 18 - 20 can be first transplanted and then receive HCV treatment. Patients with such scores are sometimes in the waiting list for more than 6 months, which is the maximum amount of time needed for HCV treatment. Therefore, under such circumstances, patients can be first treated for HCV infection and then LT can be performed. Overall, with DAA-based treatments, the number of HCV patients waiting for LT due to decompensated cirrhosis has decreased by more than 30% (86). Today, DAAs can be used for HCV patients on waiting lists for LT or post-LT cases with HCV recurrence. In HCV elimination programs (83), these drugs should be provided by healthcare policymakers, and more insurance coverage should be provided for these patients (87, 88). SOF/DCV can be used in all HCV genotypes, while SOF/LDV can be applied in patients with HCV genotypes 1 and 4; both regimens can be used in combination with weight-based RBV (1000 or 1200 mg in patients < 75 kg or ≥ 75 kg). Authors’ Contribution: Concept, Mohammad Saeid Rezaee-Zavareh, Heidar Sharafi, Seyed Moayed Alavian; Data Acquisition, Mohammad Saeid Rezaee-Zavareh, Khashayar Hesamizadeh; Data Analysis and Interpretation, Mohammad Saeid Rezaee-Zavareh; Drafting the Manuscript: Mohammad Saeid Rezaee-Zavareh, Heidar Sharafi, Khashayar Hesamizadeh; Critical Revising of the Manuscript, Seyed Moayed Alavian; Final Approval of the Manuscript, All authors.